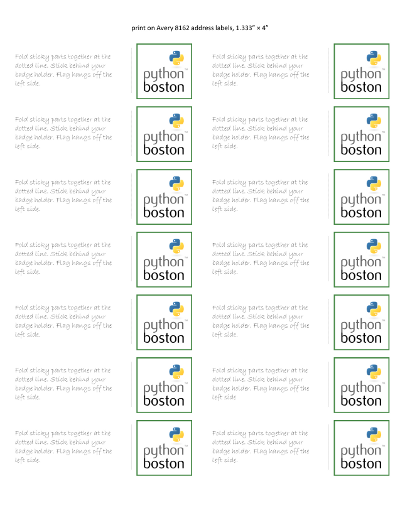 I’m really proud of how Boston Python has grown in the last year. We have over 1750 members, making us (I think) the largest local Python user group in the world. I wanted a way for all of the Boston people to identify themselves at PyCon. My first thought was naturally t-shirts, but they’re complex to make, and then people have to buy them, and you’d only wear it on one PyCon day (I hope! ), and some people don’t like wearing t-shirts in the first place. So that didn’t happen. Then I thought about simple stickers for the badge holder, but I didn’t know this year’s badge design, so I didn’t know how big I could make a sticker so that it wouldn’t obscure the name. They hang off the left side of the badge, and can be printed at home for procrastinators like me. Hopefully, the folding instructions make sense to people. Maybe it will catch on, and other tribes will make flags for their members to wear. I’ll have a bunch of them with me at PyCon, if you need one, just ask! Very cool Ned. Looking forward to wearing one of these! Why not just make ones which hang off the bottom? Other conventions are known for chaining the bottom flags. @LoriW: I started with that thought, but print-at-home paper stickers don't lend themselves to that design as well. https://www.pcnametag.com is the one that PyCon is using but their print time is 5 days not including shipping time. Currently working on if I can get some done for the local Python group that I'm a part of before tutorials.